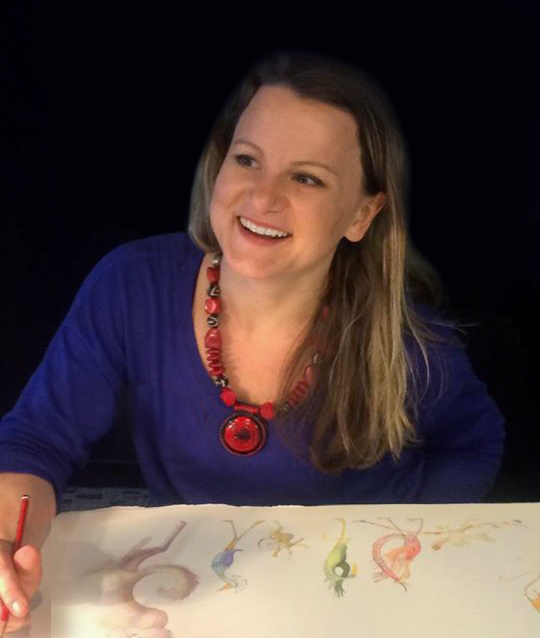 Today, it’s my pleasure to present a very interesting interview I recently conducted with the fabulous illustrator Nina Rycroft, who I met at the recent Story Arts Festival in Ipswich. As well as being a versatile and internationally-published illustrator, Nina is soon to embark on an exciting new venture. Read on! Nina, you’re inaugurating a great illustration e-course through your new venture, TreeHouse. Can you tell us about it? My interest in online teaching began back in 2010 when I became part of an E:lite and CAL funded a program training authors and illustrators with interactive white board and video conferencing equipment for online school-visits and workshops. I not only learnt how to use the technology, but also how to design and present talks and workshops specifically for online use. 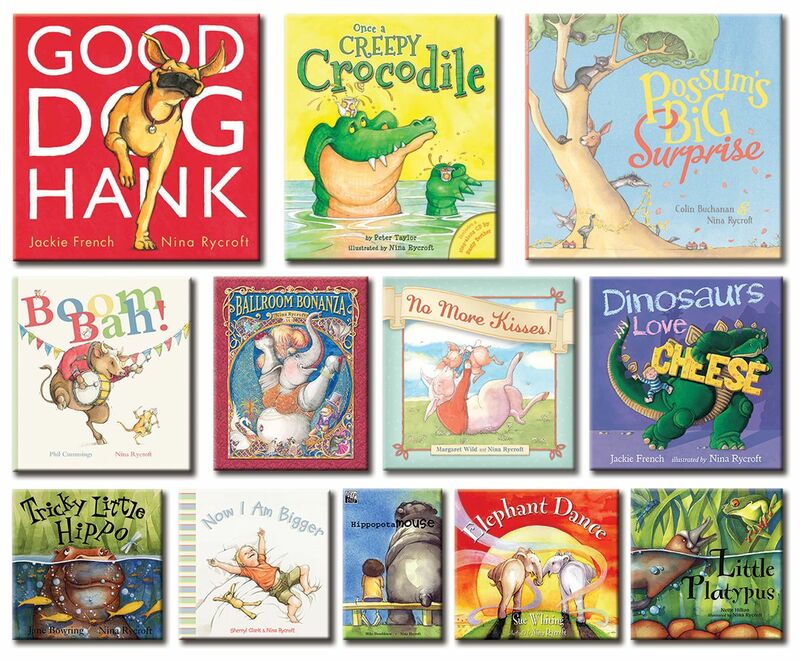 I’ve been illustrating picture books since 2000 (13 picture books world wide and winner of the YABBA 2013). Since moving from Sydney to Auckland 5 years ago I’ve enjoyed teaching picture book illustration.This combined with my background in graphic design and love of technology (used as a tool to connect and share stories)…developing an online illustration programme with a focus on visual storytelling seemed the obvious next step. Last year my husband and I bought our home on the edge of a bush reserve in Auckland. A pole house, so tall, that it looks out across the canopies and the harbour, onto Auckland’s Sky tower ― I’ve always called our home the Tree House. So when it came to naming my new venture, ‘the TreeHouse’ seemed like the perfect fit. The TreeHouse is essentially an online place that people can visit, join a community, share stories and draw! Much like illustrating a picture book, the TreeHouse offers a place to reconnect to your childlike self. It’s a place to escape the grind of ‘real’ life and explore (and play) with your creativity. The TreeHouse offers a genuine experience where you can unpack your story ideas, play without any expectations, be supported and share the creative journey with like-minded participants, and learn some illustration techniques along the way. Being an illustrator, I know all too well how isolating this job can be. So I wanted to establish a place where participants can meet, share and support each other. The collective experience is designed to keep you connected, motivated and inspired by other. Participants will gain access to an online community where they’ll be encouraged to share (set tasks) with others using a private FaceBook page and Instagram. The Treehouse Character Development e-Course covers all aspects of character development including brainstorming ideas, character design, character mapping, drawing with gesture, animation techniques and anthropomorphism. The online programme will run for 4 weeks and lessons are posted daily. Each week is designed to build on the previous weeks skills-set giving you an in-depth experience on a particular topic, with video and drawing demonstrations, printable work sheets and daily tasks. I’ve designed this e-course in such a way that it can be used to develop character for any platform, whether it be for a game, a brand or a product. This programme is designed to expand your ideas encouraging you to think, feel, develop and discover character/s for any kind of story. WEEK 1: Explore character through interviewing and visualisation techniques. Lean about face proportion, facial features and facial expression applying techniques that will bring your two-dimensional face into a three-dimensional format. WEEK 2: Learn the character mapping process. Explore character within the context of a story. Learn how to use basic body proportions to your advantage. WEEK 3: Learn techniques that will bring your character to life. Explore body movement, animation techniques and the art of drawing with gesture. WEEK 4: Explore animal character and the wide use of anthropomorphism in storytelling. Learn a simple but effective drawing technique that can translate animal traits into the human form. I would suggest participants set aside 5 hours each week for 4 weeks to get the most out of this course. There is no set time to start or finish weekly tasks, so please feel free to fit tasks in and around your lifestyle. This is an illustration programme- however you won’t be asked to draw every day. Mondays, will be an introduction and an overview for that particular week. Tuesdays and Thursday will be drawing days, Wednesdays visualisation and Fridays you will be encouraged to do a library visit and research. Who is it aimed at? And what do you hope students will get from it? The Character Development e-Course is designed for beginners as well as seasoned professionals. It allows you to take your individual skill sets and build on that. Whether you are a home schooled budding artist living in remote outback Australia, or an animation student looking to extend your skills and understanding, this course is the perfect accompaniment for your creative project. You may be a writer or a primary school teacher with a great idea for a picture book and have no previous art training. Or you may be a painter, a printmaker or perhaps you are gifted in textiles, clay, collage or glass. Whatever your creative endeavour, your experience will be a welcomed gift in the story telling arena. Using my 15 years of experience illustrating picture books, I hope to offer participants access to a supportive community as well as giving them a greater understanding of visual storytelling that will enable them to tell the best version of their story using both image and words. You’ve illustrated the picture-book texts of many well-known writers. Can you describe the process of working with other people’s texts? Do you work closely with writers or only through the publisher? I’ve had the pleasure of working with the likes of Margaret Wild and Jackie French. I enjoy visual storytelling, so my favourite type of work is when an author is willing to offer their story to me completely. Every story is different, and the process of working on a book really does depends on the individual publisher, the deadline and or course the joint vision for the story. Most of the time I am in regular contact with the publisher, I do have contact with some of the author, but mostly I meet them after I finish work on their story. With ‘Dinosaurs Love Cheese’ (Jackie French, Harper Collins, 2013), after an initial conference call (with Jackie and the publisher), discussing the main character and his relationship with his imaginary dinosaur, Jackie was more than happy to let me run with my own interpretation of her text. 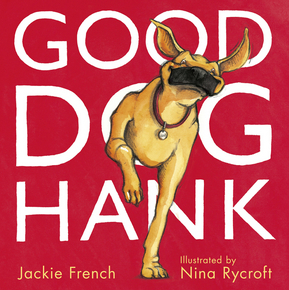 With ‘Good Dog Hank ‘ (Jackie French, Harper Collins, 2014), Jackie sent me photos of her dog Hank as inspiration for the main character. With ‘Boom Bah!’, (Phil Cummings, Working Title Press, 2008). I was given a week by the publisher to come up with a story concept (using thumbnail sketches) using the author’s text. 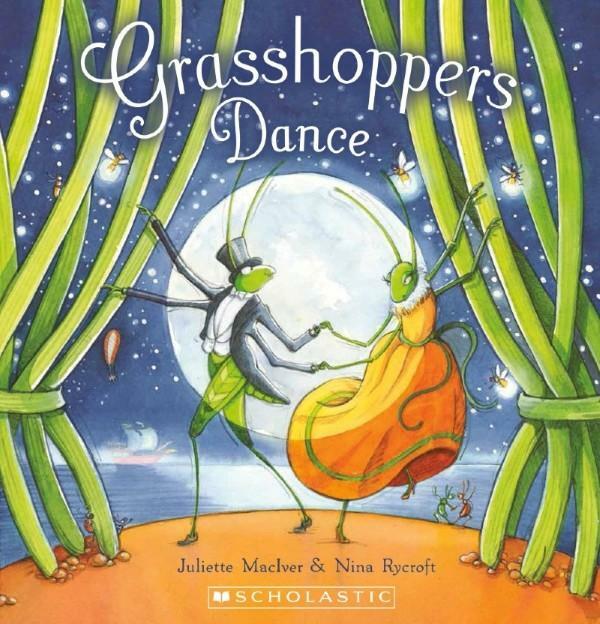 With ‘Grasshopper’s Dance’ (Julliette MacIver, Scholastic, 2015) I was lucky enough to be given free rein as far as the illustrations were concerned with Julliette (very kindly) changing a character (an orca playing an organ) I was struggling with. With ‘No more kisses’ (Margaret Wild, Little Hare, 2010), I worked entirely with the publisher. I initially illustrated human characters when the publisher was expecting animal characters. We also changed the setting from an imaginative setting ― with characters climbing up a very long ladder into the night sky, sliding down the crest of the moon, jumping from star to star ― into a more traditional setting of an English country garden. Given that the books you’ve illustrated are so different, how do you approach each individual text? I would say that over the past 15 year my illustration have evolved. I started illustrating in 2000, when I wasn’t really sure what I was doing, so you see all of me out there in my work. Over the years, I‘ve been given the opportunity to explore characters of every shape and size ― animal, human and everything in between. I’ve illustrated the milestones of a newborn through to age 5 in ‘Now I Am Bigger’ (Sherryl Clark, 2010), to a boy’s imaginary dinosaur friend in ‘Dinosaurs Love Cheese’. From Australian animal characters in ‘Little Platypus’ (Nette Hilton, 2000), animal character in a big brass band to ‘Ballroom Bonanza’ (Nina Rycroft, Working Title Press, 2007) where I had animals dancing through the letters of the alphabet at the Tower Ballroom in Blackpool. I’ve explored different illustration techniques, depending on what the story required. ‘Pooka’ was heartfelt and needed a soft, delicate approach, whereas ‘Dinosaurs Love Cheese’ asked for brighter, stronger colours, I decided to use a smudged charcoal line in ‘Good Dog Hank’ as I wanted to have the messy mischievous side of Hank come through in the line. ‘Once a Creepy Crocodile’ was bright, playful and rhythmic. Illustrations really do set the tone and mood of a book, so really, the technique that I choose really does need to suit the story. Having said this, if you look at my initial character sketches and storyboards, my interpretation of idea and character onto paper is recognisably me. 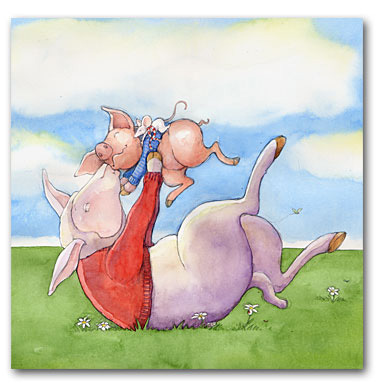 When I first started illustrating picture books, I would take any job that was offered to me. I never had the privilege of picking and choosing. In fact when I didn’t have work on the horizon, I would create it, then go knocking on doors to find it. It is delicious to be handed a story that evokes a strong feeling in me. It’s rare, but when it does happen, I am more than happy to give the story 3-6 months. When I work on someone else’s text, I am always mindful that the story has already been on an incredible journey even before I received it. So when I do get a story to illustrate, I really do take the care and give it my all. I approach each story in a very similar way. I make a point of giving myself the space to read any manuscript for the first time. I’d rather put it off, to make sure that I have time to fully comprehend what I am reading. It’s probably the only time that I don’t multi task. I find that my first ideas, the ones that pop into my head immediately after reading the story for the first time, are usually the best. Once reading a text, I then furiously start jotting down my ideas in whatever way I can. My initial thumbnail sketches usually take about a week. I make sure to warn my family as I’ve been known to forget to pick my kids up from school, clean, cook dinner, laundry etc. For that week, my mind is literally in the clouds. Personally I love the feeling of being lost in thought, it just doesn’t work very well in every day life! Once I have my thumbnail sketches ironed out, I then start work on the main characters. I may do a series of character maps and send these off to the publisher and author for approval. I then start work on larger, more detailed sketches. The publisher may have an idea how the text should be broken up, so I use this as a guide, along with my thumbnail sketches. Because it’s easier to scan and then email, I try to fit two double page spreads onto one A4 sheet of paper, working my way through the story from start to finish. I send these through to the publishers as I am working on them. It the story requires, I use printouts of the larger sketches and make them into a dummy book, basically a mock up picture book with turning pages. Sometimes I need to feel how the book feels (and reads) with its turning pages. The sketches and mock-up picture books are the skeletons of the visual and can take anywhere between 2-3 months. Once all of my character and layout sketches are approved and complete, I then need to consider colour and illustration technique. I choose a random illustration (one that shows the main characters). I then enlarge each smaller sketch to the size that it would appear in the book, and illustrate a double page spread. Once this is approved, I do this for the other 14 double page spreads. The ‘colouring-in’ process can take anywhere between 1-3 months, depending on the illustration technique I have decided to use. The front cover is always illustrated last ― the icing on the cake. Sometimes it’s very straight forward, other times, it can be a time-consuming process. You have also worked as an author/illustrator. Can you describe your process there? 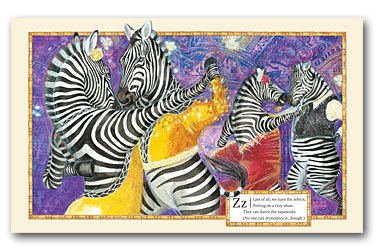 I’ve worked as an author/illustrator for my picture book titled ‘Ballroom Bonanza’. I got to a point where I had no work lined up and I was looking for a new challenge. The entire process from initial idea, writing, sketching through to illustrating, took much longer than I had first anticipated ― four-and-a-half-years longer than I had anticipated. I came up with an idea for an animal alphabet picture book where the animals competed in a dance competition much like the film ‘Strictly Ballroom’. I wanted to explore illustrating all types of animals, so this project seemed like the perfect challenge. Working with image and text was a new experience and I loved bouncing from one to the other. The initial story and sketches took three months to complete. I then sent a dummy book to two publishers before getting a positive response. This is when the story took a life of its own. Everything from that first dummy book changed. The plot, the characters, the length of written story, even the format of the book went from 32 to 40 pages. 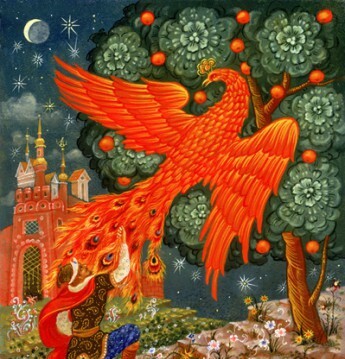 A hide and seek element was added, and even the illustration technique became more elaborate and detailed. I would say the text and dummy book took 3 years to complete, then the final artwork took another year and a half. I thoroughly enjoyed the dance between word and image and hope to do this once again. Which illustrators―past and present–have been an influence on your own work? 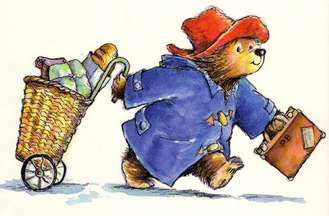 I spent my early childhood in London, so in a way I grew up on anthropomorphic characters, from Beatrix Potter’s Peter Rabbit series to the original Winnie the Pooh and Paddington Bear. I learnt about visual story-telling from reading Pat Hutchins picture books like ‘Rosie’s Walk’ and ‘Goodnight Owl’. 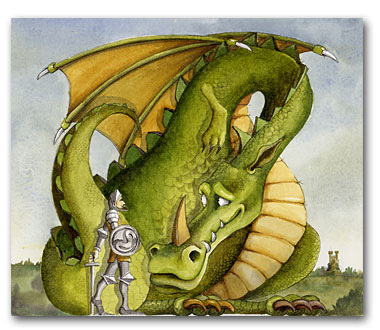 Pamela Allen is also a wonderful visual storyteller, the most memorable being ’Mr. Archimedes’ Bath’ and ‘Who sank the Boat’. Julie Vivas’ ‘Possum Magic’ taught me how to use watercolour. 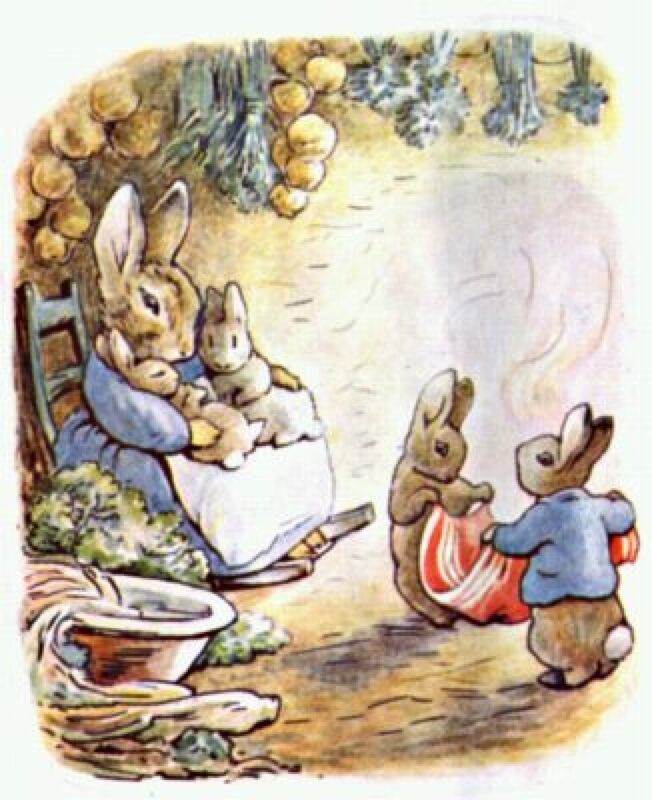 I loved how she never overworked her illustrations, and the watercolour wash was always so expressive and minimal. I’m always in awe of Armin Grede’s brave use of line and Lisbeth Zwerger’s design, composition and watercolour genius. And I love the child-like playfulness that Stephen Michael King and Bob Graham bring to their stories. To top off my long list of influential illustrators, Ron Brooks is a master artist that I have great admiration for: ‘Old Pig’ and ‘Motor Bill and the lovely Caroline’ are both illustrated with elegance and grace. Like The Treehouse on Facebook https://www.facebook.com/thetreehouse.biz?fref=ts to be notified of The Treehouse website launch, e-courses and other Treehouse events. Nina’s Redbubble page, where you can buy some of her prints, is here.